Dr. Poordad is professor of medicine at the University of Texas Health Science Center, San Antonio, and Vice President of Academic and Clinical Affairs at The Texas Liver Institute in San Antonio. Dr. Poordad received his bachelor and medical doctorate at the University of Alberta in Edmonton and completed a residency in internal medicine at St. Thomas Medical Center and Northeastern Ohio Universities College of Medicine. Dr. Poordad also completed fellowships in gastroenterology at the University of South Carolina and in hepatology/liver transplantation at the Johns Hopkins University School of Medicine. Dr. Poordad served as the co-director of liver transplantation at Johns Hopkins prior to becoming chief of hepatology and liver transplantation at Cedars-Sinai Medical Center in Los Angeles for 10 years. In 2012, he joined The Texas Liver Institute and the faculty at the University of Texas Health Science Center in San Antonio. He teaches medical students, resident and fellows and rotates on the liver transplant services at University Hospital System. Dr. Poordad also conducts a multitude of clinical research across all facets of liver disease, including viral hepatitis, fatty liver and cirrhosis. A member of the American Medical Association, the American Association for the Study of Liver Diseases, the European Society for the Study of Liver, the American Society of Transplantation and the Asia Pacific Association Society of Liver, Dr. Poordad lectures both nationally and internationally on the topic of liver disease and transplantation. Dr. Poordad has over 300 publications including numerous book chapters, abstracts, educational monographs and publishes in such journals as Gastroenterology, Hepatology, Liver Transplantation, the New England Journal of Medicine, Journal of Hepatology, the American Journal of Transplantation, and the International Journal of Artificial Organs. He has been honored by US News and World Report as one of the top 1% of physicians in his field and serves on many scientific advisory boards. 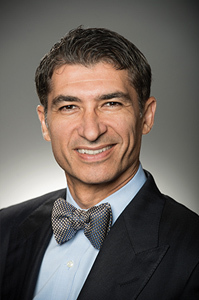 Dr. Poordad serves or has served on educational committees for the American Association for the Study of Liver Disease, the American Society of Transplantation, and the American College of Gastroenterology. He is on the editorial board of several journals, and is a regular peer reviewer for multiple journals, as well as for the AGA and AASLD annual meetings. Manns M, Marcellin P, Poordad F, Stanislau affonso de Araujo E, Buti M, Horsmans Y, Janczewska E, Villamil F, Scott J, Peeters M, Lenz O, Ouwerkerk-Mahadevan S, De La Rosa G, Kalmeijer R, Sinha R, Beumont-Mauviel M.
Simeprevir plus sofosbuvir, with or without ribavirin, to treat chronic infection with hepatitis C virus genotype 1 in non-responders to pegylated interferon and ribavirin and treatment-naive patients: the COSMOS randomised study. Lawitz E, Sulkowski MS, Ghalib R, Rodriguez-Torres M, Younossi ZM, Corregidor A, DeJesus E, Pearlman B, Rabinovitz M, Gitlin N, Lim JK, Pockros PJ, Scott JD, Fevery B, Lambrecht T, Ouwerkerk-Mahadevan S, Callewaert K, Symonds WT, Picchio G, Lindsay KL, Beumont M, Jacobson IM. Lancet. 2014 Jul 26. pii: S0140-6736(14)61036-9. Poordad F, Hezode C, Trinh R, Kowdley KV, Zeuzem S, Agarwal K, Shiffman ML, Wedemeyer H, Berg T, Yoshida EM, Forns X, Lovell SS, Da Silva-Tillmann B, Collins CA, Campbell AL, Podsadecki T, Bernstein B.
N Engl J Med. 2014 May 22;370(21):1973-82. Afdhal N, Zeuzem S, Kwo P, Chojkier M, Gitlin N, Puoti M, Romero-Gomez M, Zarski JP, Agarwal K, Buggisch P, Foster GR, Bräu N, Buti M, Jacobson IM, Subramanian GM, Ding X, Mo H, Yang JC, Pang PS, Symonds WT, McHutchison JG, Muir AJ, Mangia A, Marcellin P; ION-1 Investigators. N Engl J Med. 2014 May 15;370(20):1889-98. Kowdley KV, Gordon SC, Reddy KR, Rossaro L, Bernstein DE, Lawitz E, Shiffman ML, Schiff E, Ghalib R, Ryan M, Rustgi V, Chojkier M, Herring R, Di Bisceglie AM, Pockros PJ, Subramanian GM, An D, Svarovskaia E, Hyland RH, Pang PS, Symonds WT, McHutchison JG, Muir AJ, Pound D, Fried MW; ION-3 Investigators. N Engl J Med. 2014 May 15;370(20):1879-88. Zeuzem S, Jacobson IM, Baykal T, Marinho RT, Poordad F, Bourlière M, Sulkowski MS, Wedemeyer H, Tam E, Desmond P, Jensen DM, Di Bisceglie AM, Varunok P, Hassanein T, Xiong J, Pilot-Matias T, DaSilva-Tillmann B, Larsen L, Podsadecki T, Bernstein B.
N Engl J Med. 2014 Apr 24;370(17):1604-14. Afdhal N, Reddy KR, Nelson DR, Lawitz E, Gordon SC, Schiff E, Nahass R, Ghalib R, Gitlin N, Herring R, Lalezari J, Younes ZH, Pockros PJ, Di Bisceglie AM, Arora S, Subramanian GM, Zhu Y, Dvory-Sobol H, Yang JC, Pang PS, Symonds WT, McHutchison JG, Muir AJ, Sulkowski M, Kwo P; ION-2 Investigators. N Engl J Med. 2014 Apr 17;370(16):1483-93. Sofosbuvir and ledipasvir fixed-dose combination with and without ribavirin in treatment-naive and previously treated patients with genotype 1 hepatitis C virus infection (LONESTAR): an open-label, randomised, phase 2 trial. Lawitz E, Poordad FF, Pang PS, Hyland RH, Ding X, Mo H, Symonds WT, McHutchison JG, Membreno FE. Kowdley KV, Lawitz E, Poordad F, Cohen DE, Nelson DR, Zeuzem S, Everson GT, Kwo P, Foster GR, Sulkowski MS, Xie W, Pilot-Matias T, Liossis G, Larsen L, Khatri A, Podsadecki T, Bernstein B.
N Engl J Med. 2014 Jan 16;370(3):222-32. Daclatasvir plus sofosbuvir for previously treated or untreated chronic HCV infection. Sulkowski MS, Gardiner DF, Rodriguez-Torres M, Reddy KR, Hassanein T, Jacobson I, Lawitz E, Lok AS, Hinestrosa F, Thuluvath PJ, Schwartz H, Nelson DR, Everson GT, Eley T, Wind-Rotolo M, Huang SP, Gao M, Hernandez D, McPhee F, Sherman D, Hindes R, Symonds W, Pasquinelli C, Grasela DM; AI444040 Study Group. N Engl J Med. 2014 Jan 16;370(3):211-21. Sofosbuvir with pegylated interferon alfa-2a and ribavirin for treatment-naive patients with hepatitis C genotype-1 infection (ATOMIC): an open-label, randomised, multicentre phase 2 trial. Kowdley KV, Lawitz E, Crespo I, Hassanein T, Davis MN, DeMicco M, Bernstein DE, Afdhal N, Vierling JM, Gordon SC, Anderson JK, Hyland RH, Dvory-Sobol H, An D, Hindes RG, Albanis E, Symonds WT, Berrey MM, Nelson DR, Jacobson IM. Jacobson IM, Gordon SC, Kowdley KV, Yoshida EM, Rodriguez-Torres M, Sulkowski MS, Shiffman ML, Lawitz E, Everson G, Bennett M, Schiff E, Tarek Al-Assi M, Subramanian GM, An D, Lin M, McNally J, Brainard D, Symonds WT, McHutchison JG, Patel K, Feld J, Pianko S, Nelson DR.
N Engl J Med. 2013 May 16; 368 (20):1867-77. Lawitz E, Lalezari JP, Hassanein T, Kowdley KV, Poordad FF, Sheikh AM, Afdhal NH, Bernstein DE, Dejesus E, Freilich B, Nelson DR, Dieterich DT, Jacobson IM, Jensen D, Abrams GA, Darling JM, Rodriguez-Torres M, Reddy KR, Sulkowski MS, Bzowej NH, Hyland RH, Mo H, Lin M, Mader M, Hindes R, Albanis E, Symonds WT, Berrey MM, Muir A.
Lancet Infect Dis. 2013 May;13(5):401-8. Janssen HLA, Reesink HW, Lawitz EJ, Zeuzem S, Rodriguez-Torres M, Patel K, Van der Meer AJ, Patick AK, Chen A, Zhou Y, Persson R, King BD, Kauppinen S, Levin AA, Hodges MR.
N Engl J Med. 2013 May 2; 368(18):1685-94. Poordad F, Lawitz E, Kowdley KV, Cohen DE, Podsadecki T, Siggelkow S, Heckaman M, Larsen L, Menon R, Koev G, Tripathi R, Pilot-Matias T, Bernstein B.
N Engl J Med. 2013 Jan 3;368 (1):45-53. N Engl J Med. 2012 Aug 23;367(8):716-24. Lok AS, Gardiner DF, Lawitz E, Martorell C, Everson GT, Ghalib R, Reindollar R, Rustgi V, McPhee P, Wind-Rotolo M, Persson A, Zhu K, Dimitrova DI, Eley T, Guo T, Grasela DM, Pasquinelli C.
N Engl J Med. 2012 Jan 19; 366(3):216-24. Response-guided telaprevir combination treatment for hepatitis C virus infection. Sherman KE, Flamm SL, Afdhal NH, Nelson DR, Sulkowski MS, Everson GT, Fried MW, Adler M, Reesink HW, Martin M, Sankoh AJ, Adda N, Kauffman RS, George S, Wright CI, Poordad F; ILLUMINATE Study Team. N Engl J Med. 2011 Sep 15;365(11):1014-24. Zeuzem S, Andreone P, Pol S, Lawitz E, Diago M, Roberts S, Focaccia R, Younossi Z, Foster GR, Horban A, Ferenci P, Nevens F, Müllhaupt B, Pockros P, Terg R, Shouval D, van Hoek B, Weiland O, Van Heeswijk R, De Meyer S, Luo D, Boogaerts G, Polo R, Picchio G, Beumont M; REALIZE Study Team. N Engl J Med. 2011 Jun 23;364(25):2417-28. Jacobson IM, McHutchison JG, Dusheiko G, Di Bisceglie AM, Reddy KR, Bzowej NH, Marcellin P, Muir AJ, Ferenci P, Flisiak R, George J, Rizzetto M, Shouval D, Sola R, Terg RA, Yoshida EM, Adda N, Bengtsson L, Sankoh AJ, Kieffer TL, George S, Kauffman RS, Zeuzem S; ADVANCE Study Team. N Engl J Med. 2011 Jun 23;364(25):2405-16. Bacon BR, Gordon SC, Lawitz E, Marcellin P, Vierling JM, Zeuzem S, Poordad F, Goodman ZD, Sings HL, Boparai N, Burroughs M, Brass CA, Albrecht JK, Esteban R; HCV RESPOND-2 Investigators. N Engl J Med. 2011 Mar 31;364(13):1207-17. Boceprevir for untreated chronic HCV genotype 1 infection. Poordad F, McCone J Jr, Bacon BR, Bruno S, Manns MP, Sulkowski MS, Jacobson IM, Reddy KR, Goodman ZD, Boparai N, DiNubile MJ, Sniukiene V, Brass CA, Albrecht JK, Bronowicki JP; SPRINT-2 Investigators. N Engl J Med. 2011 Mar 31;364(13):1195-206. Kwo PY, Lawitz EJ, McCone J, Schiff ER, Vierling JM, Pound D, Davis MN, Galati JS, Gordon SC, Ravendhran N, Rossaro L, Anderson FH, Jacobson IM, Rubin R, Koury K, Pedicone LD, Brass CA, Chaudhri E, Albrecht JK; SPRINT-1 investigators. Rifaximin treatment in hepatic encephalopathy. Bass NM, Mullen KD, Sanyal A, Poordad F, Neff G, Leevy CB, Sigal S, Sheikh MY, Beavers K, Frederick T, Teperman L, Hillebrand D, Huang S, Merchant K, Shaw A, Bortey E, Forbes WP. N Engl J Med. 2010 Mar 25;362(12):1071-81. McHutchison JG, Lawitz EJ, Shiffman ML, Muir AJ, Galler GW, McCone J, Nyberg LM, Lee WM, Ghalib RH, Schiff ER, Galati JS, Bacon BR, Davis MN, Mukhopadhyay P, Koury K, Noviello S, Pedicone LD, Brass CA, Albrecht JK, Sulkowski MS; IDEAL Study Team. N Engl J Med. 2009 Aug 6;361(6):580-93.